Hillsboro’s Josh Keets plows through two Western Brown defenders in the first quarter of the Indians’ season opening game at Western Brown High School. The Hillsboro Indians got their season started on Friday night as they traveled to Western Brown High School to take on the Broncos. Hillsboro’s defense got the opportunity to prove themselves against the Broncos and held them out of the end zone forcing a turnover on down to give the Indians the ball at their own 40-yard line. The Indians promptly marched 60 yards on five rushes including 23 yards and a touch down by Josh Keets to put the Indians in front. Hillsboro added two more as Keets waltzed into the end zone on the two-point conversion to give Hillsboro an 8-0 lead with 7:57 to play in the first. The Broncos then drove 70 yards for a touchdown of their own and then missed the extra point attempt to preserve an 8-6 lead for the Indians. Both teams struggled to keep the respective offenses in check in between the 20-yard lines but found the grit to hold their opponents out of the end zone and send the game to halftime with the score sitting at 8-6. Hillsboro came out of halftime and got the first possession of the second half and drove down the field for their second touchdown of the game on a rush by senior quarterback Mason Swayne to extend the Indians’ lead. Keets then converted on the two-point try to give Hillsboro a 16-6 lead. The Broncos answered with a touchdown of their own on the next possession as the Hillsboro defense struggled to contain Western Brown. The Broncos successfully converted the two-point try to bring themselves within two points at 16-14. 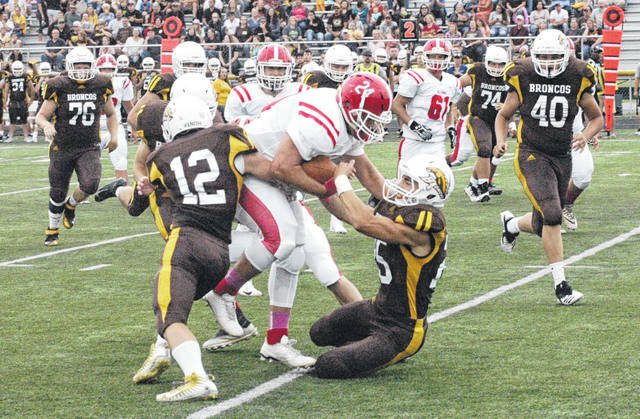 The Indians regained possession with a little less than six minutes to play in the third quarter and pounded the Western Brown Broncos for the remainder of the quarter making their way to the Broncos 15-yard line before the quarter came to a close. Swayne scored his second touchdown of the game early in the fourth quarter but was unable to convert on a pass to Keets for the two-point conversion. The touchdown pushed Hillsboro’s lead to 22-14. The Broncos appeared to be putting together a solid drive of their own before the Indians forced a fumble and recovered it at the 15-yard line. Hillsboro ran the ball three times on the possession; twice the ball went to Mark Gallimore who chewed up 14 of the 15 yards needed to score. On the third play of the drive Swayne handed off to Burns who powered over the goal line and then converted the two-point conversion to extend the Hillsboro lead to 30-14. On the ensuing possession by the Broncos they drove 60-yards after the Hillsboro kickoff went out of bounds. Western Brown needed only 44 seconds of game clock to score and convert the two-point try to get the score to 32-20 in favor of the Indians. Western Brown got possession of the ball with 5:40 to go in the game and drove down the field again completing a pass to the end zone with 3:46 to play in the game and pulled the Broncos to within two points before the two-point conversion attempt. The Broncos were unable to convert on the two point attempt as the pass bounced off the hands of the Western Brown receiver in the end zone to preserve the Indians’ lead with 3:43 to go in the game. The Indians were able to take the ball and salt the game away with a steady dose of Burns and a final back breaking scamper by Keets to get the final first down of the game with under a minute to go. Hillsboro head coach Jack O’Rourke talked about the team’s approach in the second half and why the team didn’t give the ball to Keets as much in the second half. “I went to Burns at halftime and said we are going to run behind our offensive line. We are going to put it in your hands and keep it out of theirs,” said O’Rourke. https://www.timesgazette.com/wp-content/uploads/sites/33/2018/08/web1_Keets-vs-Western-Brown.jpgHillsboro’s Josh Keets plows through two Western Brown defenders in the first quarter of the Indians’ season opening game at Western Brown High School.